Cooked and peeled coldwater prawns (Pandalus borealis) with a sauce made from mayonnaise, tomatoes, Worcestershire sauce and lemon juice. 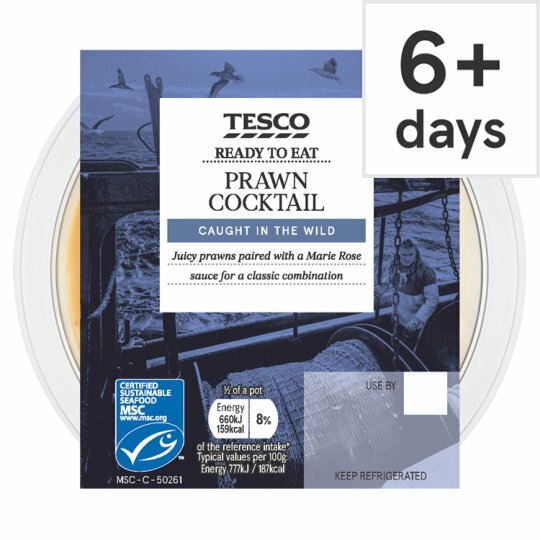 INGREDIENTS: Prawn (Crustacean) (51%), Water, Rapeseed Oil, Sugar, Cornflour, Pasteurised Egg Yolk, Salt, Tomato Paste, Spirit Vinegar, White Wine Vinegar, Worcestershire Sauce [Water, Sugar, Spirit Vinegar, Molasses, Onion Purée, Salt, Tamarind Paste, Clove, Ginger Purée, Garlic Purée], Citrus Fibre, Concentrated Lemon Juice, Mustard Flour, Pimento. May contain fish and molluscs.For allergens, see ingredients in bold. Also, may contain fish and molluscs. This product is ready to eat, stir well before serving. Caution: Although every care has been taken to remove shell, some may remain.